The Republic of Cyprus was proclaimed on 16 August 1960 as a compromise solution between the Greek and Turkish communities of the island. The Greek aspiration to enosis (incorporation of the whole island to Greece) as well as the Turkish aspiration to taksim (sharing of the island between Greece and Turkey) were rejected. According to the Constitution, the Greek community (82% of the population of Cyprus) elected the President of the Republic, Archbishop Makarios III (1913-1977), whereas the Turkish community (18% of the population of the island), elected the Vice-President of the Republic, Fazil Küçük (1906-1984). In November 1963, President Makarios proposed to Vice-President Küçük a radical modification of the Constitution, which would restrict the rights of the Turkish community. Supported by Turkey, the Turkish community rejected Makarios' proposal and an open conflict broke out between the two communities. This conflict is still unresolved. In April 1967, a military dictatorship took the power in Greece and imposed the so-called Colonels' regime. On 15 July 1974, Makarios was overthrown by a coup stirred up by the colonels, who openly supported Makarios' enemies in Cyprus. Makarios left the island and was replaced by the extremist Nikos Sampson (1935-2001). On 20 July, Turkish troops landed in Kyrenia, in the north of the island, in "accordance" with Article 4 of the 1960 treaty, which allowed the responsible parties (including Turkey) to intervene if the independence, territorial integrity or security of Cyprus was threatened. The United Nations Security Council obtained a cease-of-fire on 22 July, after the Turkish troops had occupied a significant part of the island. The Colonels' regime collapsed on 24 July and democracy was restored in Greece. In February 1975, the leader of the Turkish community, Rauf Denktaş (1924-2012), unilaterally proclaimed the Turkish Cypriot Federate State (Kıbrıs Turk Federe Devleti), which he presented as the first component of a future Cypriot federal state. Denktaş was elected President of the self-proclaimed state in 1975. In the next years, no agreement could be found between the two communities. There was a rise in tension in 1983 when Greece broke the bilateral discussions and submitted the Cypriot question to the United Nations General Assembly. Denktaş reacted by proclaiming on 15 November 1983 the Turkish Republic of Northern Cyprus. The new state was recognized only by Turkey and condemned by the international community. The Constitution of the new state was adopted on 5 May 1985, and presidential and general elections took place on 9 and 23 June 1985, respectively. The proposal for a new status of Cyprus drafted by the United Nations was rejected by referendum on 24 April 2004. Accordingly, Cyprus is still de facto divided into two parts, the Republic of Cyprus, internationally recognized, except by Turkey, as sovereign over the whole island but exerting power only on its southern part; and the Turkish Republic of Northern Cyprus, recognized by Turkey only, and exerting power on the north of the island. The capital of Cyprus, Nicosia, is also divided between the two powers. The flag of the Turkish Republic of Northern Cyprus, designed on the model of the Turkish national flag, is white with a red crescent and star and two thin red stripes near the top and the bottom of the flag. The flag was adopted by Law No. 15, enacted by the Assembly on 7 March 1984 and published in the Official Gazette on 9 March 1984. The diagram confirms the above visually, and of course, shows all the centre points mentioned on the horizontal meridian. 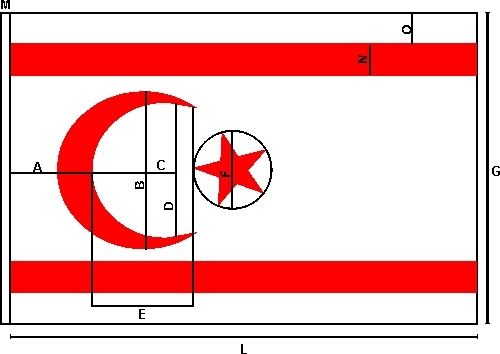 The flag of the Turkish Republic of Northern Cyprus shall be flown from buildings occupied by the Security Forces, by Government Departments, from the premises of public institutions and establishments, from the premises of the people's representatives abroad and from vessels owned by persons and corporate bodies and it shall be displayed on motor cars, in and outside the Republic, of persons authorized by regulations to display the flag on their motor cars. The Turkish Flag shall continue to be the national flag of the Turkish People of Cyprus. The coat of arms was slightly modified by a LAw passed by the Parliament on 12 March 2007. The date on the coat of arms is the year of foundation of the state and de facto loss of authority by the government of Republic of Cyprus on the northern part of the island. Smith [smi82] shows a very similar coat of arms, also in black line-drawing only. The coat of arms is, virtually, a variation of the coat of arms of Cyprus, black and white and with added crescent and star and changed dates. In Smith, there are two dates in the coat of arms, 1960 inscribed below the dove in the shield (just as it is on the Cyprus coat of arms) and 1975 inscribed above the shield, below the crescent - in the same place where is in the above image is inscribed 1963. This was the coat of arms of the Turkish Cypriot Federated State, in use from 1975 to 1984. That government was using Turkish flag as its own in the same period of time. The Ledra Museum - Observatory, on the eleventh floor of the Ermes department store, on the corner of Ledras and Arsinoes, in the Greek sector of Nicosia has a very helpful information leaflet in a number of different languages. This features a large photo entitled "A panorama of occupied Nicosia", which shows one of the most prominent buildings in the Turkish sector of Nicosia, the Selimiye Mosque, which was until circa 1570, the Cathedral of Saint Sophia. Hung between the two minarets at the front of the building is an arrangement of two horizontal wires and two vertical wires, so that the Turkish Republic of Northern Cyprus flag and the Turkish flag are almost seen to be 'floating' in the air. In the same leaflet, there are a number of close up photos of some of the city's main buildings, including a close up of the "Ayias Sofias Church (occupied)", where the flags are not visible! Smaller versions of both flags are also often to be found inside mosques, at the pulpit, where the preacher speaks to the congregation from. The above picture was taken inside the Lala Mustafa Pasha Mosque in Famagusta, (former Cathedral of Saint Nicholas), with the permission of the mosque authorities. In January 2003, Turkish Cypriots in Nicosia demonstrated with flags of the European Union with a golden map of Cyprus inside. The demonstrators demanded a new, free of any troops, united Cyprus and the withdrawal of Mr. Denktaş, the President of the Turkish Republic of Northern Cyprus. - The first variant had a yellow map (or golden since some of these flags were made by the demonstrators themselves) inside the twelve yellow stars of the European Union flag. - The second variant was more interesting: the twelve stars were again yellow as in the European Union flag but the map of Cyprus was copper! A yellow shading below the copper map could be seen! It was in fact a yellow map "under" a cooper one! Doruk Foundation (website) was established in April 2016 with the purpose of fostering education, culture, art, research and development to all social layers of the society, especially young people, in particular to educate a qualified generation dependent on national, spiritual and human values. The flag of the foundation (photo) is white with the foundation's logo. In Turkish, doruk means "a peak", "a crest", "a summit", which explains the mountains featured on the foundation's emblem.